After releasing well over a year ago the Pebble smartwatch has been long over due for a makeover, and now it's available in three new bright colors for a limited time. 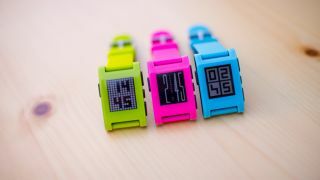 Pebble launched its inaugural wearable in three previously unreleased shades called TFresh Green, Hot Pink, and Fly Blue. Other than the swanky new colors these Pebble smartwatches still offer up the same functionality and $150 (about £88, AU$161) price point. Act fast though. Pebble told TechRadar these colorful bands will only be available for a limited time until supplies last. After they're gone buyers will have to go back with to the old black, grey, red, white, and orange colors. Alternatively, users looking for a more professional band could go for the Pebble Steel, essentially the metal version of the smartwatch. Along with the new color options Pebble also announced it has added the Weather Channel to its growing app store, which is already stocked with apps like ESPN, Mercedes cars, Yelp and Pandora. Lastly a Reading Rainbow time face featuring the likeness of LeVar Burton in an 8-bit style is rumored to arrive later this year. How does Android Wear fare in the wearable world?